Hello and welcome to our live coverage of stage 3 of the Volta a Catalunya. Today's queen stage runs 179km from Sant Feliu de Guíxols to the summit finish of Vallter 2000 at Setcases. We're around 10 minutes away from the start of stage 3. Today's stage is undoubtedly the hardest of the race, featuring a third category climb, two first cats and a haute category summit finish. We could even see the final destination of the leader's jersey decided today. We also have live coverage of Driedaagse Brugge-De Panne running today. Click here to follow. Team Sunweb's Michael Matthews won yesterday's second stage, his first victory of the season. Read our report here. The other big story of stage two was Chris Froome's crash and subsequent 14-minute time loss. Read up on that story here. The race last visited Vallter 2000 back in 2014, when there was a similar run-in featuring the Port d'Oix and Port de Rocabruna before the summit finish. Tejay Van Garderen won that stage, beating Romain Bardet to the line for his first WorldTour victory. Joaquim Rodríguez went on to win the overall, beating Alberto Contador. Last year there was also a stage to Vallter 2000 planned (featuring the same threeclimbs in the finale), but it was drastically altered due to the threat of avalanches. Current race leader Thomas De Gendt ended up taking the win on that day. The riders have set off to start the stage already. Joey Rosskopf (CCC Team), Huub Duyn (Roompot-Charles) and Jesper Hansen (Cofidis) don't start stage 3. 11 riders have broken away from the peloton and are currently two minutes up the road. No word on the makeup of the breakaway yet. The race had a stage finish at Vallter 2000 back in 2013 as well. On that occasion Nairo Quintana took the victory, six seconds ahead of Alejandro Valverde and Joaquim Rodríguez. The break has passed the first climb of the day, the third category Alt de la Ganga. Álvaro Cuadros (Caja Rural-Seguros RGA) led them over, with Pieter Weening (Roompot-Charles) and Óscar Cabedo (Burgos-BH) in second and third. So we have a few names of the escapees – Sergio Samitier (Euskadi-Murias), Bart De Clercq (Wanty-Groupe Gobert) and Lennard Kämna (Team Sunweb) are also out there – but no full group yet. Jumbo-Visma, AG2R La Mondiale and Arkéa-Samsic also have men up there. Photo of the break from the race Twitter feed (@VoltaCatalunya). 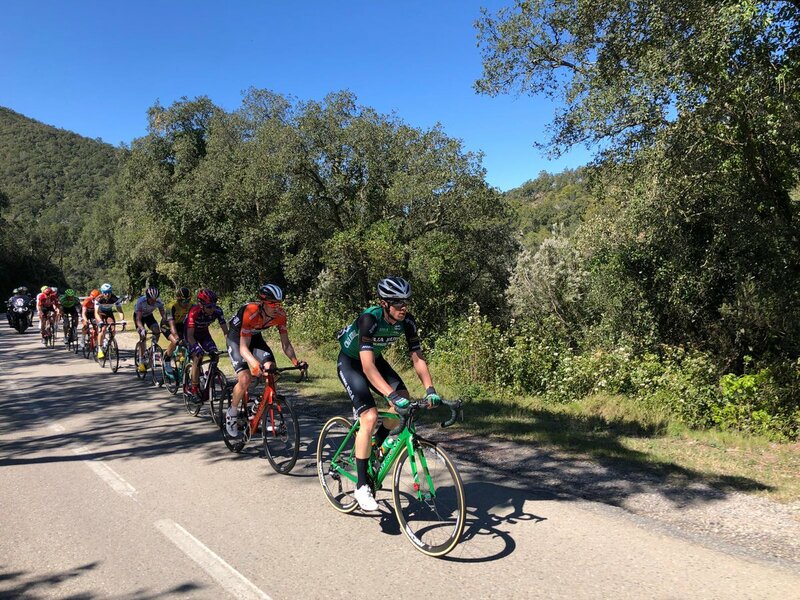 Here's the full breakaway: Álvaro Cuadros (Caja Rural-Seguros RGA), Óscar Cabedo (Burgos-BH), Sergio Samitier (Euskadi-Murias), Bart De Clercq (Wanty-Groupe Gobert), Maurits Lammertink, Pieter Weening (both Roompot-Charles), Lennard Kämna (Team Sunweb), Dries Devenyns (Deceuninck-Quick Step), Francois Bidard (AG2R La Mondiale), Anthony Delaplace (Arkéa-Samsic), Bert-Jan Lindeman (Jumbo-Visma). The break is currently 5 minutes up on the peloton. Over at Driedaagse Brugge-De Panne they've covered 50km and a breakaway is up the road. Follow the race live with Stephen Farrand here. 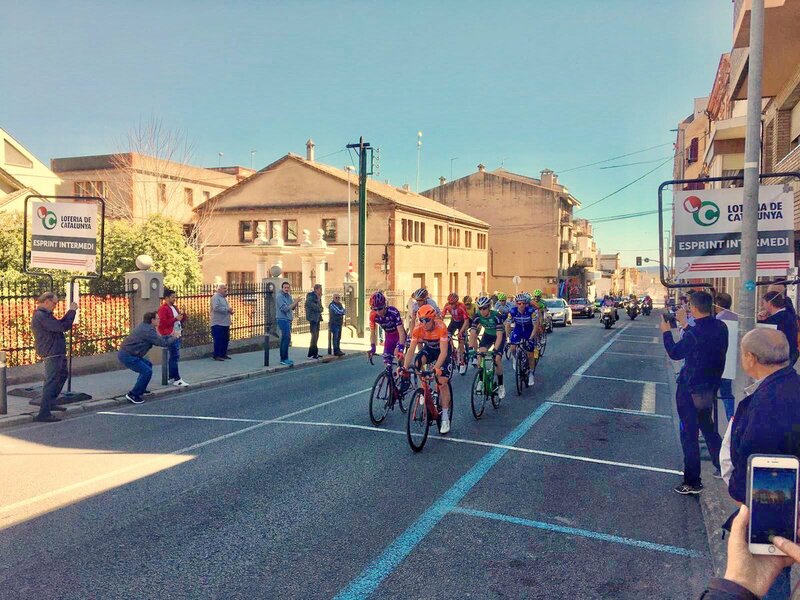 Still some way to go until the next 'feature' on course – the intermediate sprint at Banyoles. The next climb of the day doesn't come until almost 130km into the stage. The eleven-man break still hold a five-minute gap at the moment. It's a largely flat day today, up until the 90km mark when the unclassified climbing starts. A lot of kilometres to wear down the legs before the real action starts on the Port d'Oix. 140km to go over in Driedaagse Brugge-De Panne and the break there have around 4:30 over the peloton. Meanwhile in Catalunya, the break is four minutes up on the peloton. There should be a plethora of names in with a chance of taking the win today. As Romain Bardet (AG2R La Mondiale) said before the stage, "There is a lot of great contenders so, we will have a good battle." In addition to Bardet, here's a look at the other names in contention for the win on Vallter 2000. Movistar have Nairo Quintana and Alejandro Valverde, while Richard Carapaz is another option. Enric Mas heads up Deceuninck-Quick Step's challenge. Egan Bernal and Ivan Sosa will head up Team Sky. Miguel Ángel López and Pello Bilbao are Astana's men, and the Yates brothers lead Mitchelton-Scott. Then there's Thibaut Pinot (Groupama-FDJ), Steven Kruijswijk (Jumbo-Visma), Max Schachmann, Davide Formolo (both Bora-Hansgrohe), Wilco Kelderman (Team Sunweb), Richie Porte (Trek-Segafredo), Michael Woods (EF Education First), Dan Martin (UAE Team Emirates), Ilnur Zakarin (Katusha-Alpecin) and Warren Barguil (Arkéa-Samsic). The break are approaching the sprint at Banyoles. They have five minutes on the peloton. Maurits Lammertink led the break over the sprint at Banyoles. Álvaro Cuadros and Oscar Cabedo rolled across the line in second and third place. Here's a shot of the break crossing the line, from the race Twitter feed (@VoltaCatalunya). Back to today's contenders though, and we have a few stories up on the site about Alejandro Valverde, Thibaut Pinot and Michael Woods. Valverde, who finished second yesterday, said after the stage, "My body is reacting well to the recent efforts, and the team is working perfectly, so let's see what we can do in Vallter tomorrow." Woods has said he's perhaps not at his best here, offering his thoughts on the final three climbs today: "It’s not a crazy difficult climb, but the two climbs prior to it make it very difficult, especially with the technical descents." Finally, Pinot said yesterday that today's stage will be the biggest challenge of the race, with the high altitude and "the level of the field here" making it a "real challenge." Back in the race, the situation remains the same. Check out our new story for the latest news from Chris Froome, who crashed yesterday. "Potentially, I might add in the Tour of the Alps. I'll get a good training block in after this and then look into adding the Tour of the Alps, the Tour de Yorkshire and get a few more race days," he says. We're inside the final 100km of the stage now. The 11-man break is 5:40 up on the peloton. The break are around 10km from the feed zone, and still some 40km from Port d'Oix. Our man in Catalunya Alasdair Fotheringham reports warm and dry weather at the foot of the final climb. The break's advantage over the peloton is 5:40. Not too far now from the next categorised climb, the Port d'Oix. They're inside the final 70km over at Driedaagse Brugge-De Panne. Follow that race live here. Over an hour until live television coverage of the stage begins. Hopefully there'll be more updates on the race situation in the meantime. The situation remains the same as the break reach Port d'Oix. 11 men up front with a 5:40 advantage on the peloton. We're inside the final 60km of the stage now. The Port d'Oix is 7km long with a 5.4%. Lotto-Soudal, Movistar and Jumbo-Visma are leading the peloton. The gap is apparently down to 4:30 actually. The average speed so far has been 39km/h. For a closer look at the final three climbs of the day, here's a look at the Strava segments of Port d'Oix, Port de Rocabruna and Vallter 2000. No surprise that the top spots are taken up by riders who contested the stage when the race visited back in 2014. Carlos Verona holds the record up Oix, the now-retired Jérémy Roy was the fastest up Rocabruna, and Romain Bardet (who finished second at the finish) was fastest up Vallter 2000. The latest update is that the break are still climbing Port d'Oix. Live pictures coming in around 15 minutes. Cuadros took the points over the top of Port d'Oix, followed by Weening, Devenyns, Delaplace, Bidard and Lammertink. It looks like there wasn't much of a fight for the points, with the break just rolling over the line. According to Alasdair Fotheringham, our reporter in Catalunya, there's a tailwind going up the final climb of the day, Vallter 2000. Should make for a ascent, then. The break starts the Port de Rocabruna now. They're 3:40 up on the peloton. Movistar are leading the peloton at the moment. 17km to go over at Driedaagse Brugge-De Panne. Follow live here. Movistar, Sky and Mitchelton-Scott each have two cards to play here, and they're all up front. Just six men remain up front in the breakaway. Weening, Cuadros, Samitier, De Clercq, Devenyns and Lindeman are there. Bidard is still there too. The gap isn't really budging, despite Movistar's work on the front of the peloton. Cuadros leads over the top of Port de Rocabruna too. Weening, Devenyns, De Clercq, Lindeman and Bidard follow. After a short descent, the break are on a short flat section before the road gradually starts ramping up again to the final climb. Here's an in-depth look (in Spanish) at the final climb, which officially starts in 12km. As you can see, there are double-digit gradients in the final two kilometres, as well as the third and fourth kilometres of the climb to Vallter 2000. Overall, it's 11.4km long, with an average of 7.7%. Here's Sky's Chris Froome leading the way on the snowy ascent of the climb back in 2014. The conditions are much better today. 21km to go and the break are 3:30 up the road. Andrey Amador has hit the deck. He was leading the peloton through a tight corner and slid out, with a couple of other riders crashing behind him. He looks ok though, but it doesn't look like he'll make it back to the peloton at the rate he's going. Under three minutes for the break now. They're 6km from the start of the climb. Samitier isn't in the break. Just six up front now. Movistar still driving a large peloton. Samitier makes his way back. now seven men up front. Samitier, Devenyns and Lindeman put in a dig. Lindeman touched the back wheel of Devenyns and nearly swerved into the passing moto. Lotto-Soudal are on the front of the peloton now, riding for De Gendt. Movistar still there too. More attacks in the break. Weening, Lindeman, Samitier and Devenyns dropping De Clercq and Bidard. Just 1:30 between the peloton and the break now. Lotto doing the damage that Movistar were faliing to do. Lindeman chases Weening up front. Samitier and Devenyns can't hang with them. Now Team Sky take the front of the peloton. Narváez, Henao, Sivakov riding for Bernal. Weening is alone out front now, with a good gap. Lindeman didn't make it up to the Roompot man. Sky are really pushing the pace here. The front of the peloton is strung out and it's shrinking in numbers. Just a minute to Weening now. De Gendt drops from the peloton. He won't hang on to the leader's jersey today. Half a minute between the reduced peloton and Weening now. Maybe about 20 riders in the peloton. Just 12 riders remain in the GC group. Weening is caught. Just the GC men now. Sosa, Bernal, Pinot, Quintana, Kruijswijk, Dan Martin, Woods are all in there. Valverde isn't in the lead group. Schachmann and Pello Bilbao are with Valverde, chasing the lead group. Woods and Kruijswijk are hanging on at the rear of the lead group. Bernal launches! Quintana is right with him. No answer from anybody else. They're racing at around 1800 metres altitude right now. No surprise that the Colombians are leading the way. They climb up to 2148 metres at the finish. Simon Yates is leading the chase. De Gendt is 1:25 down on Bernal and Quintana right now. Quintana isn't doing any work here. It's all Bernal. Simon Yates is getting closer to the duo. Yates catches them. The lack of co-operation from Quintana let him back in. Quintana is still refusing to work. López and Dan Martin catch the leaders. Yates attacks. Martin and López dropped, try to catch the trio after Yates attack. Bernal tries an attack. Quintana and Yates respond. Martin and Lopez keep catching before the lead trio attack and drop them. Just the four up front now. Martin dropped. Final kilometre. De Gendt is technically still in the race lead, just hanging on. The wind changes from head to tail as they navigate the hairpins. Martin is back with the leaders. The five are still together. Bernal leads with Quintana on his wheel. Final 500 metres. No further attacks yet. Chase group enters the final km. Bigger gaps than we've seen in the past on this mountain. Sky really pushed the pace on the early slopes. A slowing down from the leaders as the approach the final metres. Quintana and Yates lead the way. Yates goes past on the outside of the final corner! And Adam Yates takes the win ahead of Bernal! Dan Martin took third, Quintana fourth. Now the wait for De Gendt. Can he hold on? Quintana was 2:56 down at the start of the day. Various groups coming in. Two minutes have passed. De Gendt appears! He finishes around 2:22 down, just behind Valverde. De Gendt hangs on to the race lead. Top three on GC should be De Gendt, Bernal and Quintana by my estimation. Second win of the season for Adam Yates after his victory on stage four of the Vuelta Valenciana. Yep, the GC was wrong. Here's the revised top ten with Bernal ahead of Martin. We're back in the mountains tomorrow, with a stage to La Molina. Three first category climbs and a mid-stage haute category climb are on the menu. The finish is easier than today, though. Still, look out for the same contenders as today. And that's all from me today. Come back tomorrow for full live coverage of stage 4!